It’s always difficult to find the perfect dress to wear to a wedding as a guest, but there are plenty of great options out there. So today we’re taking the guesswork out of it by sharing 25 of our very favorite dresses perfect for attending a wedding. Read on to check them out. This lace dress has a beautiful combination of a green lace overlay on top of a pale blue lining, creating a very unique pattern. The three quarter length sleeves would be perfect for a fall or winter wedding, when the weather is a bit cooler. Buy it at Francesca’s. If you’re in the market for a conservative style dress, this crew neck style dress with ruffled flutter sleeves would be perfect. The blue color looks pretty on most complexions, and the style would be perfect to show off your favorite statement necklace. Buy it here. This gorgeous blush pink dress has a lovely open-weave style lace design, and a flattering empire waist style. The spaghetti straps give it a dainty feel, despite the full coverage and modest length. Make your way over to Anthropology to see all the details. This understated yet beautiful dress could be dressed up or down, depending on the type of wedding you’re attending. It has a V-shaped neckline in both the front and the back, and it is available in multiple colors. Head on over to Loft to check it out. This stylish military green dress would be perfect for a more casual wedding, and you can spice it up with some ankle boots as shown on the model above. The poly fabric makes it easy to pack if you’re traveling. Head to Banana Republic to read about all the details. This stunning abstract patterned dress has a unique combination of colors, everything from pink to red to blue. The dress has a more formal feel, thanks to its darker hue and pleated skirt style. Make your way over to The Limited to find out more information. If you enjoy floral patterns, this feminine pink and blush option might fit the bill perfectly. The tie waist gives it a comfortable, easy-going feel, while the open neck adds some serious style. 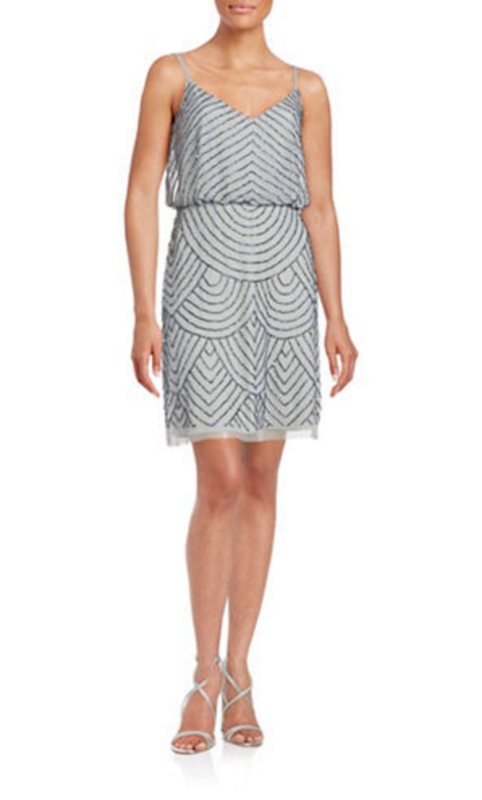 Head on over to Loft to find out more about this pretty frock. This lacy number has a beautiful allover floral texture, thanks to a pretty organza fabric overlay. The lining stops at the shoulders, so the sleeves have a lovely open lace look. And the navy color makes it appropriate for a number of different types of weddings. Buy it here. 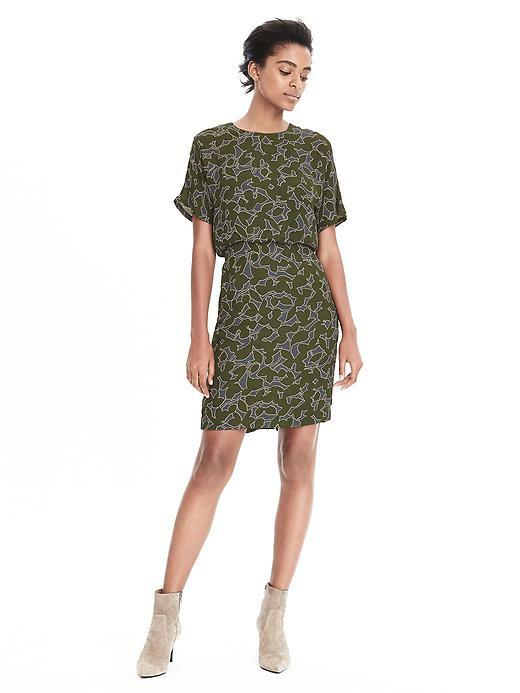 For a more breezy style, give this vibrant forest green dress a try. The halter neckline shows off your shoulders, while the nipped-in empire waist lends a flattering silhouette. The fabric is very airy and free, giving it a relaxed vibe. Get it over at Lulu’s. For a more formal wedding, this beautiful black lace sheath dress would be a great option. The below-the-knee hemline makes it appropriate for a black tie optional wedding, but also for a semiformal affair. Find out more about it over at Loft.com. This open work lace dress is a beautiful periwinkle blue color, and is accented by unique crocheted strips down the center of the bodice and across the waist line. And the hemline extends lower than the lining hem, for a fun twist. Buy it over at Ruche. This lovely floral print dress has a rich blue color which provides a bold background for the blush and sage green floral pattern which covers whole piece. The tie waist adds an extra bit of stylish flair. Head on over to Forever 21 to check out the details. 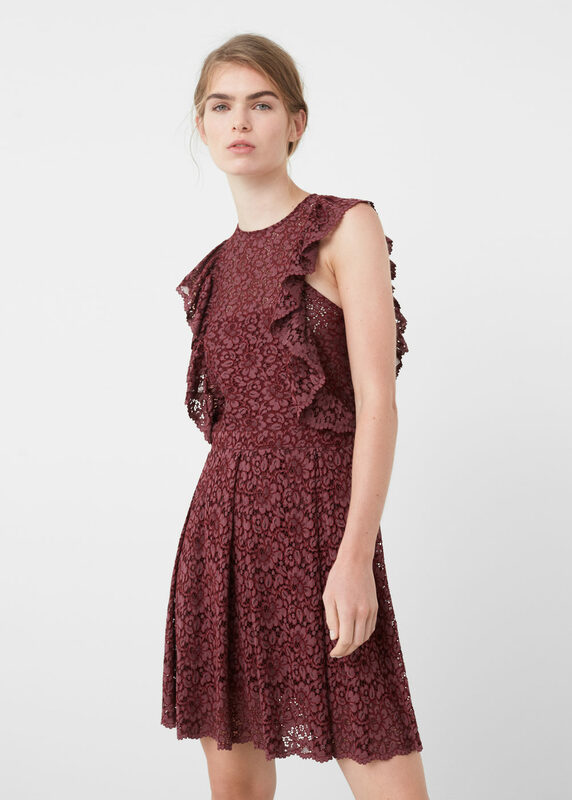 If you love lace, then this maroon allover-lace dress might be a great option for you. The crew neck is offset by decorative ruffles that encircle the sides of the bodice. The dark red wine color would be perfect for a fall wedding. Head over to Mango to check it out. 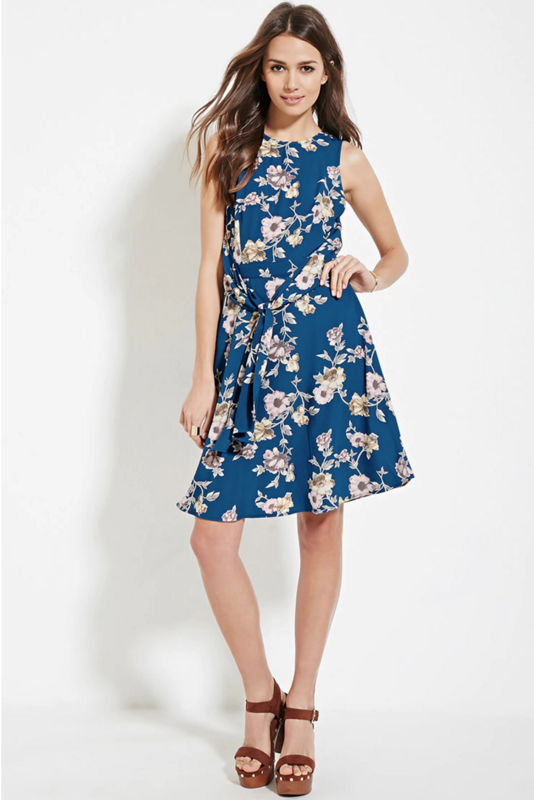 Midi length dresses are all the rage right now, so why not get in on the trend with this beautiful dress from Asos? The halter-style top has some intricate embellishments, while the plain flowing skirt offsets it. Head on over here to see all the details. This black textured dress would be perfect for any wedding that’s a bit more on the formal side, thanks to its dark color and dressy style. The top layer is a modern, geometric take on lace, laid over a black lining that is a bit shorter on the top and bottom. Buy it here. This unique dress has a bit of a 1950’s feel to it, with a modern length and neckline. The oversized floral print is very eye-catching without being overwhelming, while the colors are muted and elegant. Head over to Asos to find out more about this beauty. 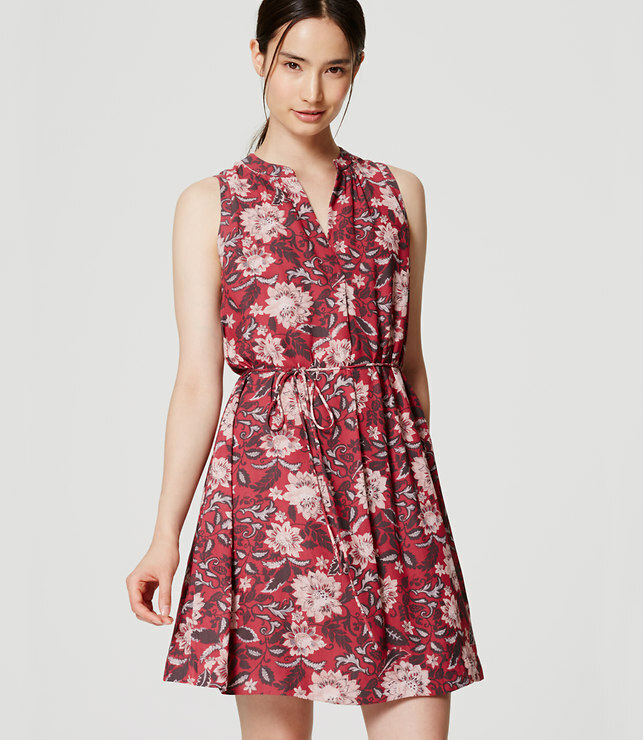 Here’s another floral dress, this time in a bolder color scheme and a different silhouette. This pretty little number has a halter neckline and reaches the top of the shin, making it an approachable version of the midi trend. Check it out over at Ruche. This black dress has a unique combination of a gold-accented jacquard top, paired with a pleated flowing black skirt. The hemline is a play on the high-low look that has been popular of late, and a built-in belt finishes the look. Head over to Asos to buy it. Show off your shoulders with this unique look from Mango. The dark red fabric has a tiny black and white pattern covering it, while the long sleeves are given a bit of sexiness with the cut-out shoulders. Make your way over to Mango to check out the details. 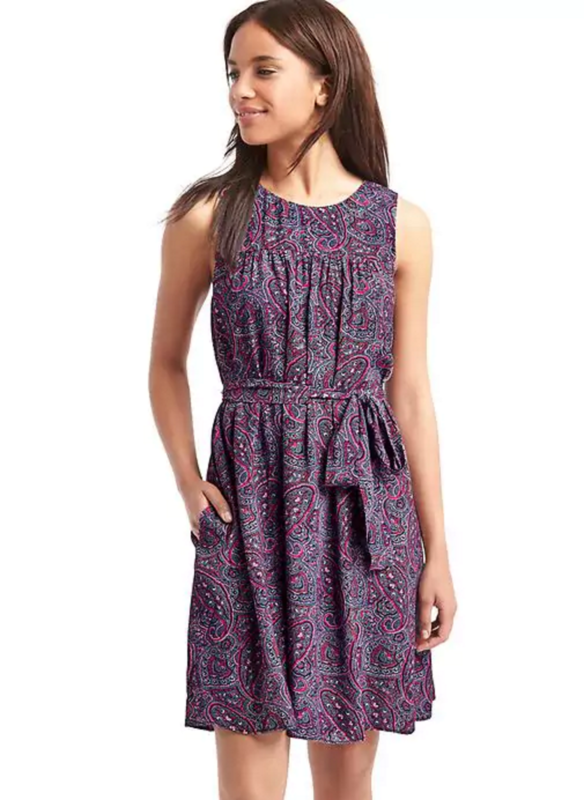 If you’re a fan of paisley, then you’ll love this sweet purple dress from Gap. The yoke is shirred to create some extra detail up top, while a set of pockets and a tie waist adds dimension. 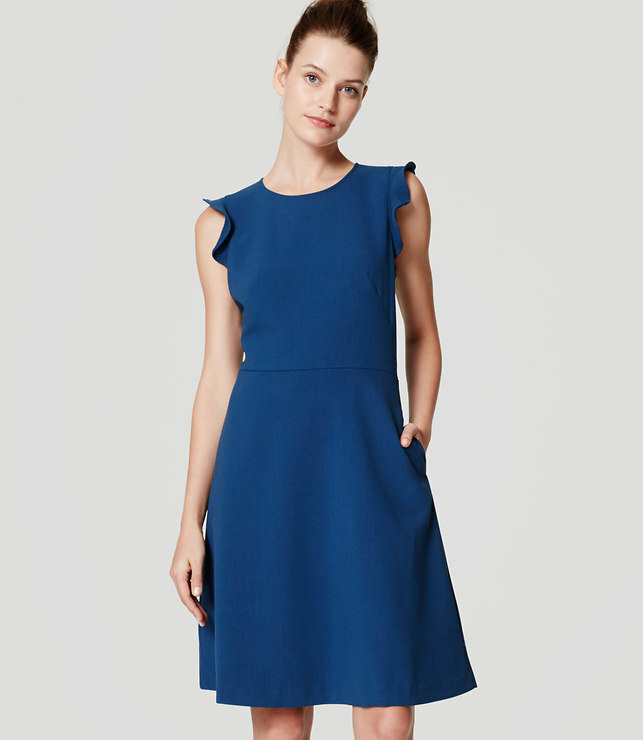 Head on over to Gap.com to read all about the details of this pretty number. This elegant black and silver dress has a bit of extra personality, thanks to its energetic pattern which draws attention up to your face. The halter neckline creates a flattering look, while the hemline falls a couple of inches above the knee. Get it over at Dillards. This gorgeous vibrant purple dress has a lovely ruched side seam, along with a beautifully sparkly area over the lace-embellished neckline. A keyhole adds a unique final touch to the look. Make your way over to Macy’s to check out all of the details. If you enjoy the flapper girl style of the 1920’s, then you’re sure to love this understated option which is reminiscent of the style back in the early twentieth century. The spaghetti straps give it a modern touch. Head over to Lord & Taylor to check it out. 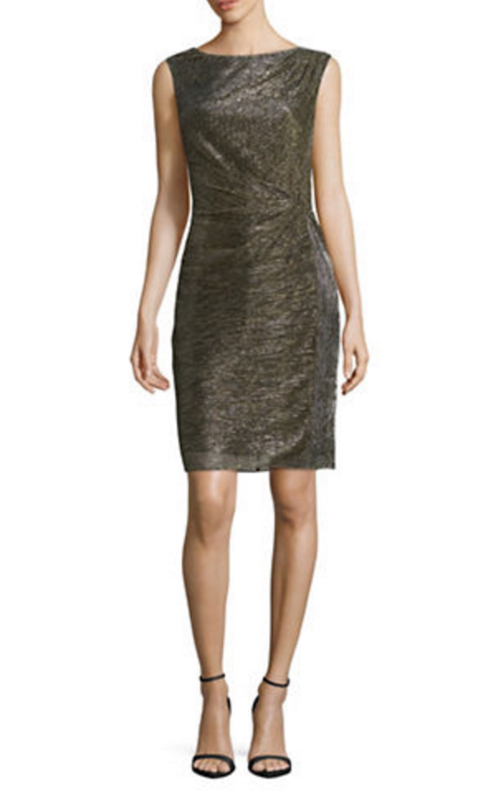 This beautiful dress has an understated look that is the perfect balance to the bold look of the gold lamé fabric. A subtle ruched section on one side of the waist adds a tailored look, making it even more flattering. Head over to Lord & Taylor to read more about it. And last but certainly not least, this stunner of a black dress has a beautiful crossed neck style, drawing attention to the neckline. The flared skirt gives it an extra feminine look. 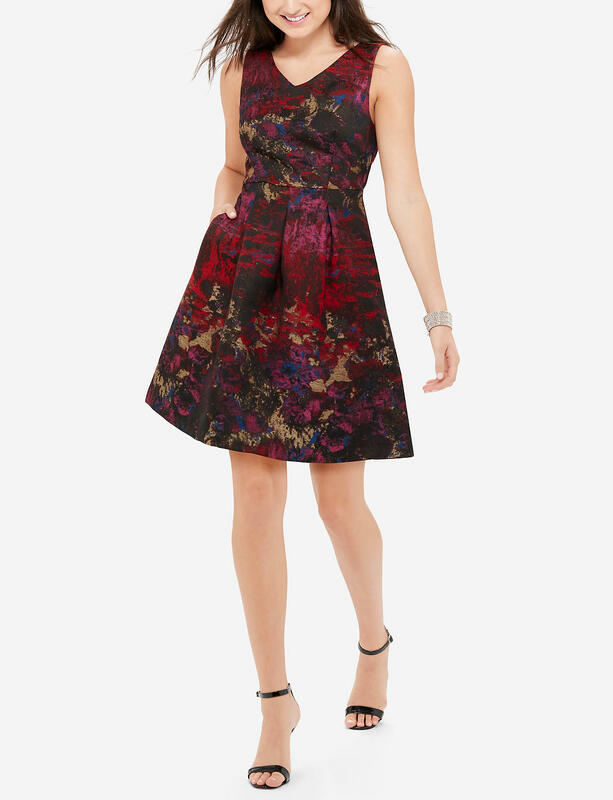 Head on over to Macy’s to check out all the details of this pretty wedding guest dress.